And the last to leave. Designed to give you open-angle views out onto the water, the balconies make an ideal hangout. Full kitchens mean you don't have to go out for treats. They're as close as the freezer. 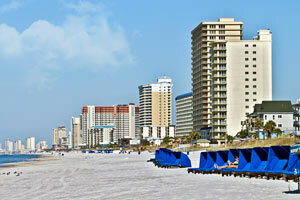 Sterling Resorts - Sterling Reef rises above the endless Gulf horizon and snow-white sands of Panama City Beach. Go sunbathing on the sundeck next to do the outdoor bi-level pool until the kids splash you - then hop on in and return the favor. Pick your cardio routine right where you left off at the on-site fitness center. Set up camp on a stationary bike and enjoy the gorgeous ocean views. When it’s time for lunch, head to the third level sky terrace and host a family cookout thanks to the bbq grills. For rainy days or when you’re looking for a break from the beach, the activity center is a kid-magnet, stocked with games and a big screen TV. Two-bedroom condos sleep up to six guests. Bring the family along to the Publix supermarket for groceries to stock your full kitchen. When you return to your condo, bake up a batch of your famous sugar cookies and let the kids be in charge of the cookie cutters (be sure to pack some from home!) Don’t worry if the kids end up covered in sugar and flour, you’ll have an in-suite washer/dryer. Cable TVs with DVD players are perfect for family movie night. Bring favorite movies from home or take advantage of the free DVD rentals available at the resort. Private balconies face the sea at an open angle, giving you the best views possible, perfect for watching the sunset. Sterling Reef is a quick walk to Shipwreck Island Water Park. Little ones will love the activity pools at the Tadpole Hole. Ride the Zoom Flume mat slide, grownups and kids can ride together. Feeling daring? The Pirates Plunge dual slides are sixty-feet tall. There are two rides with height restrictions: The Tree Top Drop has two sixty-five-foot-tall slides, and Raging Rapids is a white-water rafting inner tube ride. Take a family field trip to Coconut Creek Family Fun Park. Challenge the kids to a game of mini golf; there are two eighteen-hole courses for any skill level. Test your navigational skills on the Gran Maze; it’s almost as big as a football field. The course frequently changes, so each experience is different. If you’re in need of some retail therapy, visit Pier Park Mall. Department stores include JCPenney and Dillard’s. Treat yourself to a massage or facial at Massage Envy Spa. Head to Target and Marshalls for bargains. Hungry? Dave & Buster’s, Red Robin and Longhorn Steakhouse are just a few of your dining choices. - Front desk is open 10:00 AM-4:00 PM and is closed on Sunday. Guests that are planning to arrive after 4:00 PM please contact the property in advance using the information on the booking confirmation to receive a code to a lock box located outside of the front desk. The individual making the reservation must be 25 years of age or older and must occupy the rental property the entire term of the reservation. Singles under 25 years of age are prohibited unless accompanied by a parent or legal guardian. Restrictions may apply regarding the number of people that may accompany a parent or legal guardian.